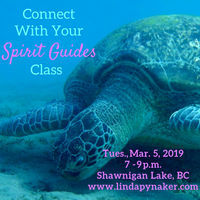 This is an opportunity for you to learn how to connect with your spirit guides so that you may receive messages from them and develop more meaningful relationships. You will become more able to benefit from their support. Registration is limited to 6 people. Linda Pynaker, MSW, is an accomplished author and psychic medium. She is able to connect with your loved ones in spirit through trance. During readings, you may explore career, relationships and health. Linda is also able to connect with your spirit guides through trance, review past lives and provide one-on-one intuitive training. She has appeared on radio and television and is a vibrant international speaker. Her books, Make It Happen! Use Your Intuition and Positive Spirals, Messages of Hope and Healing and Time to Heal are available on amazon, her website at www.lindapynaker.com and most bookstores. More info about Linda is available at www.lindapynaker.com.